Given the incredible momentum behind the S&P 500 (as a risk gauge) and persistent tumble from the US Dollar (as a safe haven) this past week, we would assume that the Yen crosses would be hurtling higher on carry appetite. In reality, the FX market’s more ‘risk’ sensitive currency was virtually unmoved. The tepid progress from the exchange rates themselves matched volatility measures – both implied (expected) and realized. Does this lack of momentum reflect the quality of risk trends or is testament to a tempering of one of the market’s most impressive trades? Risk trends, 4Q Japanese GDP data and a BoJ rate decision this week will put this question to the test. In the hierarchy of fundamental effectiveness; traditional measures such as growth, monetary policy, yield forecasting and other traditional pricing measures for currencies fall short of the more elemental ebb and flow of interest appetite (‘risk trends’). This is especially true for the Yen crosses. Though they may have retraced some of their gains, the pairs are still between 12 and 38 percent higher than where they were 18 months ago. We have not seen a recovery in carry, growth forecasts or volume to match this performance. Instead, we have seen investors take advantage of a period of low volatility and an effort at forcible yen devaluation push the crosses higher. Should that buoyancy vanish, this group will look exceptionally ‘overpriced’ and the fundamental reconciliation could be painful. While a yen trader should always have their eye on risk trends, the theme will be particularly important over the coming week. Some benchmarks for sentiment have experienced an incredible surge this past week, but certain distortions are making for an uncertain outlook. Where the Emerging Markets have mounted an impressive recovery, the S&P 500 has returned to record high and volatility measures have deflated much of their recent swell in risk premiums; the fundamental backdrop hasn’t improved materially for investors. If the bound in ‘risk’ these past two week was simply a correction of the late January, market-wide stumble; it will come with natural limitations. Furthermore, it leaves the impression that these markets are prone to future bouts of deleveraging. Even in the absence of a definitive tip in the greed-to-fear scale, the Yen is still looking at serious fundamental pressure in the week ahead. Just as important as the backdrop of a global yield grab to the currency has been the persistent belief that the Bank of Japan (BoJ) is committed to devaluing its currency. Whether the open-ended stimulus program can claim the effectiveness so many have attributed to it or not is irrelevant. It has inspired speculators to run the crosses alongside equities. That said, the impact of this program has been priced in well beyond the purchases made to this point. Considerable forward expectations for asset purchases and even an acceleration of the effort is no doubt reflected in the exchange rates we see now. What happens when reality falls short of expectations? Mere months after the BoJ introduced its open-ended stimulus program back in April, it was the baseline assumption that the central bank would further upgrade its effort to reinforce its drive to end deflation and offset the ill-effects of a planned tax hike at the turn of the fiscal year (April). However, the verbal warnings and reassurances of more support have notably dropped off in recent months. Instead, we are seeing remarks of confidence that the economy is on its way to meeting its inflation target (2 percent by 2015) and concerns that wage growth is not keeping pace with inflation that is exacerbated by a falling currency. Though this week’s BoJ meeting is not expected to result an actual change in monetary policy (if it did, the yen cross would be sharp), the market will be looking for telltale signs that the group is still supporting stimulus and the currency’s tumble. Furthermore, Monday morning’s 4Q GDP figure will calculate into officials’ and investors’ expectations for the need of more support. Things can get particularly dicey this week if risk trends take a turn for the worse and scheduled event risk doesn’t accommodate stimulus hopes. The Australian Dollar advanced for the third consecutive week a swell in risk appetite continued to feed demand for the sentiment-geared currency. A minor setback came by way of January’s deeply disappointing jobs report, the move lower failed to produce significant follow-through as we suspected last week and the post-data selloff was promptly overturned within a day. The currency appears vulnerable to renewed selling in the week ahead however and we have entered short AUD/USD at 0.90. The lion’s share of the Aussie’s recovery over the past two weeks has mirrored a snap-back in risky assets as the traders digested and began to retrace the knee-jerk reaction to a bouquet of emerging-market jitters that emerged in late December. The S&P 500 and the VIX volatility index – investors’ so-called “fear gauge” – have now all but returned to where they started when the panic began. Furthermore, the latest positioning figures from the CFTC show speculators are once again net-long S&P 500 futures having been the most net-short in eight months as of February 4. From here, big-picture trends ought to return to the spotlight, with the focus on the disparity between disappointing US economic data and the firm commitment to continue “tapering” QE asset purchases by the Federal Reserve. The week ahead brings the publication of minutes from January’s FOMC meeting as well as the US CPI data set. If comments from Fed officials over recent weeks are any indication, the US central bank is looking through the current soft patch in US performance and seemingly has no intention to slow or pause the process of reducing QE in $10 billion/month increments. Meanwhile, the headline year-on-year inflation rate is seen ticking up to a six-month high at 1.6 percent. On balance, this bodes ill for the Australian unit. US economic news-flow has increasingly underperformed relative to expectations since mid-January. This coupled with rhetorical and data-based support for continued reduction in Fed accommodation is likely to fuel concerns about the implications of a prolonged deceleration in the world’s largest economy for the pace of global growth at large. Needless to say, that bodes ill for sentiment and has scope to initiate a far better-supported liquidation in the risky asset space than the transitory EM-driven selloff. US Dollar Set to Fall Further as S&P 500 Surges. What Could Change? The Dow Jones FXCM Dollar Index (ticker: USDOLLAR) fell for 10 consecutive trading days and finished at multi-month lows on a wave of mediocre US economic data and a sharp rally in global equity markets. Can it continue to fall in the week ahead? Traders will look to the coming week’s US Federal Open Market Committee (FOMC) Meeting Minutes and Consumer Price Index inflation figures to drive Dollar moves. Yet it may take some sharply positive surprises out of FOMC minutes or other economic data to shake the Greenback from two consecutive weeks of declines. Why? An important drop in FX volatility prices shows that few are betting on and/or hedging against big currency moves through the foreseeable future. Given that the safe-haven US currency tends to do poorly in slower-moving markets, conditions may prevent a meaningful Dollar rebound. Of course any surprises out of Fed minutes could change that in a hurry. The Federal Open Market Committee has now scaled back its Quantitative Easing program by $10B in each of its past two meetings, and most indications point to similarly predictable moves through March and beyond. Yet it’s difficult to ignore two consecutive disappointments in US Nonfarm Payrolls employment reports. Any special emphasis on employment data in FOMC minutes could hurt the Greenback, while a lack of references to the same figures may spark a meaningful bounce. Attention will then turn to Thursdays US CPI inflation figures. Consensus forecasts point to a relatively lackluster inflation print through January, and recent Fed rhetoric suggests that officials do not fear a significant pickup in price pressures through 2014. Such complacency nonetheless leaves risks to the topside; it would take a relatively modest upward surprise to spark a US Dollar bounce. The Greenback has a difficult week ahead with low volatility and a resurgent US S&P 500 limiting demand for relatively safe currencies or financial assets. Of course as our Senior Currency Strategist points out the calm always comes before the storm in financial markets. Long-term volatility prices for the Euro/US Dollar exchange rate recently fell to their lowest levels since the onset of the global financial crisis in 2007. The declines show little fear of huge swings in the EURUSD or elsewhere. But that likewise implies that it could take fairly little to shake markets out of complacency. It’s difficult if not impossible to place trades on the “unknown unknown”, and our short-term Dollar forecast remains bearish. Yet it will be important to keep an eye out for unexpected developments that could materially shift US Dollar and financial market forecasts. Last edited by 1Finance; 02-15-2014 at 07:53 AM. The British Pound rallied to a fresh yearly high of 1.6722 following the Bank of England (BoE) Inflation Report, and the GBPUSD may press higher next week should the fundamental developments coming out of the U.K. highlight a stronger recovery for 2014. Indeed, another 20.0K drop in U.K. Jobless Claims should prompt a bullish reaction in the sterling, but a soft Consumer Price report paired with a marked slowdown in Retail Sales may generate a near-term correction in the GBPUSD as the pair carves a higher high in February. Nevertheless, it seems as though the BoE removed the 7% unemployment threshold as jobless claims are expected to contract for 14 consecutive months in January, and the Monetary Policy Committee (MPC) Meeting Minutes may spur a further shift in the policy outlook should we see a growing number of central bank officials show a greater willingness to normalize monetary policy sooner rather than later. As a result, market participants now largely see the first rate hike coming at the end of this year or in early 2015, but Governor Mark Carney may sound increasingly hawkish over the coming months amid the growing threat of an asset-bubble in the U.K.
With that said, the bullish sentiment surrounding the British Pound should gather pace over the near to medium-term, and the next topside target in around 1.6800-50 as the Relative Strength Index breaks out of the bearish trend dating back to September. In turn, we will retain our game plan to ‘buy dips’ in the GBPUSD, and we will continue to look for higher highs paired with higher lows amid the ongoing shift in the BoE policy outlook. Gold prices surged this week with the precious metal advancing more than 4% to trade at $1319 at the New York close on Friday. The rally marks the second consecutive weekly advance, pushing prices to their highest levels in over three months as the greenback turned heavy. 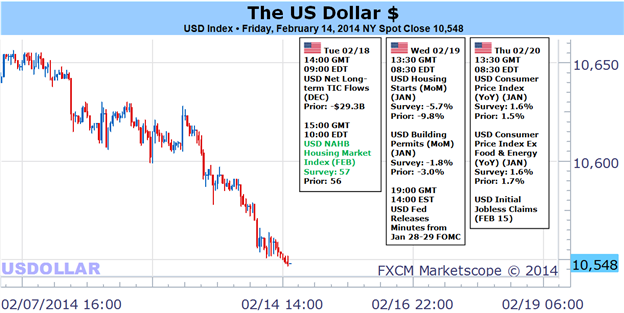 The USD has struggled since the start of the month with the Dow Jones FXCM USDOLLAR index falling near three-month lows as concerns over the strength of the recovery and the pace of the Fed taper come into question. Heading into next week traders will remain focused on the US economic docket with housing starts, building permits, existing home sales and inflation data on tap. With the recent softness on the data front and the new Fed Chair Janet Yellen pledging to keep policy accommodative until such time where the recovery can be deemed as ‘sustainable’, weaker prints next week could continue to fuel speculation that the recovery is slowing, a factor that would likely pressure the Federal Reserve to scale back the pace or even pause QE tapering. Interruptions to the Fed’s exit strategy are likely to remain supportive for gold prices/ bearish for the USD in the near-term. The main event next week will be the release of the minutes from the January policy meeting, Bernanke’s last as Fed Chairman. Should the minutes show an increased discussion as to the softness in both employment/inflation data, look for gold to remain supported with key technical barriers seen just higher. From a technical standpoint, the broader medium-term outlook shifted to the topside with the break and close above the $1268/70 barrier we noted a few weeks back. With the secondary objective at $1319 having already been achieved, the focus with a breach now shifts to the 23.6% retracement of the decline off the 2012 high at $1325 with more significant resistance seen at $1336/38. Daily RSI has now signaled an overbought condition for the first time since August and its first directional break of magnitude above this threshold since August of 2012 where prices mounted a much more aggressive rally. Bottom line, the gold trade remains constructive above the $1268/70 threshold, with near-term support seen at $1291. With the USDOLLAR index now at a key support level, look for a pullback early next week to offer favorable long exposure. The US dollar had a rough week, suffering from weak data. A rate decision in Japan, German business sentiment surveys, UK job data, US housing and employment data as well as the FOMC Meeting Minutes are the major events on our calendar. Here is an outlook on the main market movers for this week. Janet Yellen gave her first official testimony, stressing that the central bank will continue to taper its asset purchases as planned as long as the labor market continues improving. Yellen assured markets that the Fed’s policy will continue in line with the policy approach taken by her predecessor, Ben Bernanke. US retail sales disappointed, dropping 0.4% with disappointments also in the core number and with downgrades for December. It seems that the bad weather might have a significant effect on the economy, and that not all the weakness is due to bad weather. The importance of the NFP is growing. And there are lots of things going on elsewhere: In Europe, stronger than expected GDP outweighed growing fears of ECB action. In the UK, the new forward guidance seems to hint of a UK rate hike earlier than thought and the pound reached new multi-year highs. Things are not looking so good everywhere: In Australia, terrible job figures halted the currency’s recovery. Japan rate decision: Tuesday. Bank of Japan Governor Haruhiko Kuroda said in the last BOJ press conference that overseas risks have subsided and domestic economy is progressing in line with the banks projections, therefore no change is required in monetary policy or in rates. Rising inflation and stronger economic activity may induce companies to spend more on wages and investment. UK inflation data: Tuesday, 9:30. UK consumer price inflation, reached the BOE target of 2% in December, pushed down by lower computer games and food prices. CPI’s return to the BOE’s comfort zone will ease the pressure on the MPC enabling them to leave monetary policy unchanged. UK consumer price inflation is expected to remain at 2.0%. German ZEW Economic Sentiment: Tuesday, 10:00. German business climate declined unexpectedly in January reaching 61.7 from 62 in December, however remained elevated suggesting an upward trend in German economic activity. Analysts expected the index to rise to 63.4. Germany’s economy grew by a mere 0.4% in 2013, however stronger expansion of about 1.5% is expected this year. A small drop to 61.3 is forecasted this time. UK employment data: Wednesday, 9:30. The UK unemployment rate declined more than expected in the November, dropping to 7.1%, after a 7.4% reading in the second quarter. This low release moved closer to the BOE’s threshold, below which the bank will start raising rates. Jobless claims continues to fall, dropping 24,000 in December after a 36,700 decline in November, below the 33,800 drop anticipated by analysts. Total workforce increased by 280,000 to 30.2 million in the third quarter. Jobless claims are expected to decline by 18,300 for January. The unemployment rate is expected to remain unchanged at 7.1% for December. US Building Permits: Wednesday, 13:30. Building permits in the US declined more than expected in December, reaching 986,000, below the revised November rate of 1,017,000, suggesting construction activity lost momentum in the early part of 2014. Analysts expected an annual rate of 1.015 million. Nevertheless, despite the recent decline, 2013 showed a positive upbeat to housing permits authorizations. Economists expect the housing market to improve further in 2014. Building permits are expected to go down to 980,000. US PPI: Wednesday, 13:30. U.S. producer prices jumped 0.4% in December posting their largest gain in six months amid sharp rise in gasoline prices. This rise was preceded by a 0.1% drop in November. Nevertheless inflation remains rather subdued from a year ago. In light of the current growth in 2014, prices are expected to continue their modest rise. Meanwhile Core CPI excluding volatile food and energy costs advanced 0.3%, the biggest gain since July 2012, after climbing 0.1% the prior month. Since the Fed is planning to end its asset purchases in 2014, low inflation will enable the Fed to keep interest rates near zero for a longer period of time. Another climb of 0.6% is expected now. FOMC Meeting Minutes: Wednesday, 19:00. In its January decision, the U.S. Federal Reserve continued to scale back their bond-buying stimulus program but declared that future decisions will depend on continuous evaluation of economic conditions. While economic indicators have soured since, the details that will be provided by the minutes are expected to shed some light on the thoughts of the members. It is important to note that the composition of the voting members has changed in 2014. Chinese HSBC Flash Manufacturing PMI: Thursday, 1:45. This independent measure of Chinese strength has a significant effect on global markets. The previous release kicked off the emerging markets’ rout after it dropped to the contraction zone, below 50 points. A small slide from 49.5 to 49.4 is expected. US inflation data: Thursday, 13:30. Core inflation in the US remained unchanged at 0.1% in December in line with market consensus after climbing 0.2% in November. Lower energy prices were offset by a rise in other products. Since Consumer prices are the main indicator for inflation, the Fed closely monitors its releases. The small rise in prices indicates inflation is subdued. Core inflation is expected to rise by 0.4%. US Unemployment Claims: Thursday, 13:30. The number of Americans filing new claims for unemployment benefits declined 2,000 last week to a seasonally adjusted 339,000, indicating the job market remains strong and that the number of layoffs is decreasing. The reading was higher than the 331,000 forecast by analysts but the average figures have stabilized getting closer to pre-recession levels. Economists believe unemployment rate will drop by a quarter of percentage point due to an emergency federal program, which expired last week. However the general condition of the US job market is constantly improving, household confidence is and income have increased and the manufacturing sector keeps expanding. Unemployment claims are expected to decline to 335,000. US Philly Fed Manufacturing Index: Thursday, 15:00. Factory activity in the U.S. mid-Atlantic region gained momentum in January climbing to 9.4 after 6.4 in December. This reading topped predictions for 8.8 points. However the future orders fell to 5.1 from 12.9 in December while prices paid reading rose to 18.7 from 16.4. Nonetheless the index has been positive for eight consecutive months indicating continues growth trend in the manufacturing sector. Factory activity is expected to decline to 9.2. US Existing Home Sales: Friday, 15:00. U.S. existing home sales advanced in December to an annual rate of 4.87, after posting 1.82 million in the previous month, reaching the highest level in seven years. Sales in 2013 totaled 5.09, up 19.5% since 2011. However economists expect the housing boom to cool off in 2014 and return to normal levels of a 5.1% growth. Existing home sales is expected to reach 4.73 million. 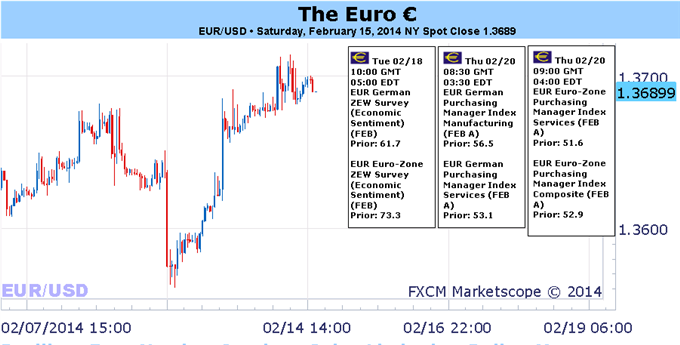 - The retail forex crowd remains short EURUSD – and has added to losing positions. - The Euro’s relative fortunes may be improving as the tides have turned against the US Dollar. Last week didn’t provide much of any considerable price action in the FX markets, and the Euro’s performance mirrored that of the broader market. The EURUSD did gain +0.42%, but that’s all the gains the Euro could find; yet losses were limited to a maximum of -0.41% against every other major currency but for the British Pound (-1.62%) which is in a world of its own right now. Midweek the Euro looked shaky for one of the only reasons to entertain a bearish Euro bias at present time: threats of policy action to ward off the appearance of impending deflation. Several European Central Bank policymakers have suggested one of a cut in the main deposit rate, another LTRO, or even weakening the Euro directly could be employed. None of these calls are coming at a time when crisis conditions are present. Not surprisingly, the more aggressive dovish commentary in recent weeks has come from France, a country with a declining rate of export growth over the past three-plus years. French exports have fallen from +10.7% y/y in the 3Q’10 to +1.5% in the 4Q’13. A weaker Euro would absolutely help French exporters get a competitive edge. But it’s much easier for policymakers to blame a seemingly crooked exchange rate for the problems than the misguided policy created by their own hands; c’est la vie. There has to be good reason for the ECB to remain on hold all these months despite the continued downswing in inflationary pressures. Even as export growth in the region has been stunted, a stronger Euro might not be such a bad thing for the Euro-Zone at present time. With unemployment rates, especially among the youth, elevated to at or near all-time highs, inflation would more quickly erode purchasing power from a struggling consumer base. Just like higher taxes and reduced government spending (austerity) can provoke consumers to spend less (simple opportunity cost of what to do with diminishing available capital), more inflation in an environment characterized by a weak labor market and low wage growth could cripple consumption and drive the Euro-Zone back into recession. This past week, two developments along this front arose: updated inflation expectations from the ECB remain firm towards +1.7% to +2.0% over the medium-term; and the 4Q’13 GDP report was better than expected at +0.5% y/y versus +0.4% y/y expected. The 3Q’13 GDP figure was also revised higher to -0.3% y/y from -0.4% y/y. In support of the ‘a stronger Euro is helping’ argument, consider that on an equal-weighted basis versus the Australian Dollar, the British Pound, the Japanese Yen, and the US Dollar, the Euro gained +1.12% in the 3Q; growth accelerated in the 4Q when the Euro basket gained +4.01%. In February, the Euro’s gains have been limited to against the Japanese Yen and US Dollar, by +1.28% and +1.51% respectively. Realistically, the Euro might need a spark to help it gain traction elsewhere. This is not purely the result of weak data on the Euro front (the Citi Economic Surprise Index increased to 15.0 on Friday from 9.2 of the prior week); but rather sincere improvement in other currencies. We maintain that a BoE-styled Funding for Lending Scheme (FLS) has become a more appealing outcome, and it could address credit concerns without putting the Euro at risk of a massive ECB balance sheet expansion that another LTRO or a Fed-styled QE would bring. We remain optimistic on the Euro, especially as extreme US Dollar positioning builds. The euro rose to a three-week high against the dollar on Friday, as better-than-expected euro zone fourth quarter growth data allayed fears over more monetary tightening by the European Central Bank. Japan is to release preliminary data on fourth quarter gross domestic product, the broadest indicator of economic activity and the leading indicator of economic growth. Australia is to publish data on new vehicle sales. In the euro zone, the eurogroup of finance ministers is to hold a meeting in Brussels. Markets in the U.S. are to remain closed for the Presidents Day holiday. The euro zone is to publish data on the current account. Meanwhile, the ZEW Institute is to release its closely watched report on German economic sentiment, a leading indicator of economic health. The U.K. is to release data on consumer price inflation, which accounts for the majority of overall inflation. Canada is to produce data on foreign securities purchases. The U.S. is to release data on manufacturing activity in the Empire State. Australia is to publish data on the wage price index, as well as a private sector report on an index of leading economic indicators. The U.S. is to publish reports on building permits, housing starts and producer price inflation. Meanwhile, the Federal Reserve is to publish the minutes of its most recent policy setting meeting. Japan is to publish data on the trade balance, the difference in value between imports and exports. China is to release the preliminary reading of the HSBC manufacturing index. The euro zone is to publish closely watched data on manufacturing and service sector activity, while Germany and France are to publish individual reports. Germany is also to publish data on producer price inflation. The U.K. is to produce private sector data on industrial orders. The U.S. is to release the weekly report on initial jobless claims and data on consumer price inflation. The nation is also to release data on manufacturing activity in the Philadelphia region. The BoJ is to publish monetary policy meeting minutes. The U.K. is to produce official data on retail sales, the government measure of consumer spending, which accounts for the majority of overall economic activity, as well as data on public sector net borrowing. Canada is to publish reports on retail sales and consumer price inflation. The U.S. is to round up the week with private sector data on existing homes sales. The U.S. dollar touched three-week lows against the Swiss franc on Friday, after data showing that U.S. factory output fell unexpectedly in January clouded the outlook for the recovery. The dollar fell against the yen on Friday as an unexpected drop in U.S. factory output in January added to concerns that the economic recovery has lost momentum since the end of last year.